Happy National Donut Day! Yaaaaaasssss! If there has to be holiday for food, let it shine on DONUTS! Although, let's get one thing straight: Donuts are NOT just limited to this day. Every day should be donut day! In this blog post, we'll be focusing on something that delights me in every way imaginable, do(ugh)nuts. Rochester is home to so many confectionary creations waiting to be devoured by you. For those of you who subscribe to the blog or follow along social media, you may have seen my publication, 'Go Nuts for Local Donuts' in the Fall/Winter issue of Mann's Jewelers Accent Magazine. I was asked to find five places in the donut world in Rochester. It was a tough job, but someone had to be on donut duty! Make sure you pick up the most recent copy at your local Wegmans or in-store at Mann's! This blog post is an extension of that article with additional donut spots that you have to try at least once in your life. Promise me that, ok? In randomized order, I bring you your very own Sir Rocha Says Crawl for donuts. Go Nuts for these Local Donuts! You can count on knowing someone in Rochester who remembers going to Donuts Delite when they were a kid. Lucky for you that despite the five-year hiatus from 2005 to 2010, your childhood fave is still going strong and better than ever. Donuts Delite reopened back in 2010 in conjunction with Salvatore's and they have struck the right balance in staying true to the essence of Donuts Delite utilizing many of the original recipes from the Malley family, but staying up to date with bringing an innovative mindset to doughnut game. With over 40+ rotating flavors to choose from classics to new, you will be sure to find your round pastry of choice. If I had to only choose that one, that one will transport you to doughnut heaven, it would be their Cannoli Doughnut. The perfectly chilled creation is filled with ricotta cheese and chocolate chips and softly dusted with powdered sugar. Nick Semararo, the managing partner at Donuts Delite, had told me how you will enjoy the Donuts Delite experience from start to finish. Not only did I enjoy it, but I was transported to my own doughnut sanctuary. Schutt’s pronounced like "Shoots" is one of those places where once you visit, you will be back, again and again. My ode to Schutt's, where do I begin? Let's begin with the Schutt family and how this business has been in the family for over 4 generations. Last summer, I had the pleasure of watching current owner, Evan Schutt make the infamous fried cakes and talk about the family business. Evan, the Schutt family, and staff are extremely hardworking and dedicated to giving their customers the very best! Walk into a warm and welcoming atmosphere coupled with freshly pressed cider and fried cakes. Life doesn’t really get any better than that. Every morning, homemade batches of Glazed, Cinnamon Sugar, and Plain fried cakes are made & infused with one special ingredient – apple cider. The cider itself is preservative free and made with their locally grown apples. Pair the cider with a hot, gooey Glazed Fried cake and I promise that you can literally taste Fall in your mouth. Check out the local goods featured in the store, along with their newly built tasting room, where you can sample a the Blue Toad Hard Cider made with 100% Schutt’s Apple Mill Cider. WARNING: Do not leave the store without an Apple Frost, a soft serve vanilla treat made with none other than the Apple Cider! Ridge Donut Cafe has been in the Marcello family for 36 years and serves as a go-to spot for many locals. It was formerly located on East Ridge Road, hence the name ‘Ridge Donut’ and currently resides on Portland Ave. Home to the Apple Fritter, which is #1 on your must-try list! Not only is it massive, but you can taste the cinnamon, chopped apples and love poured in every bite. 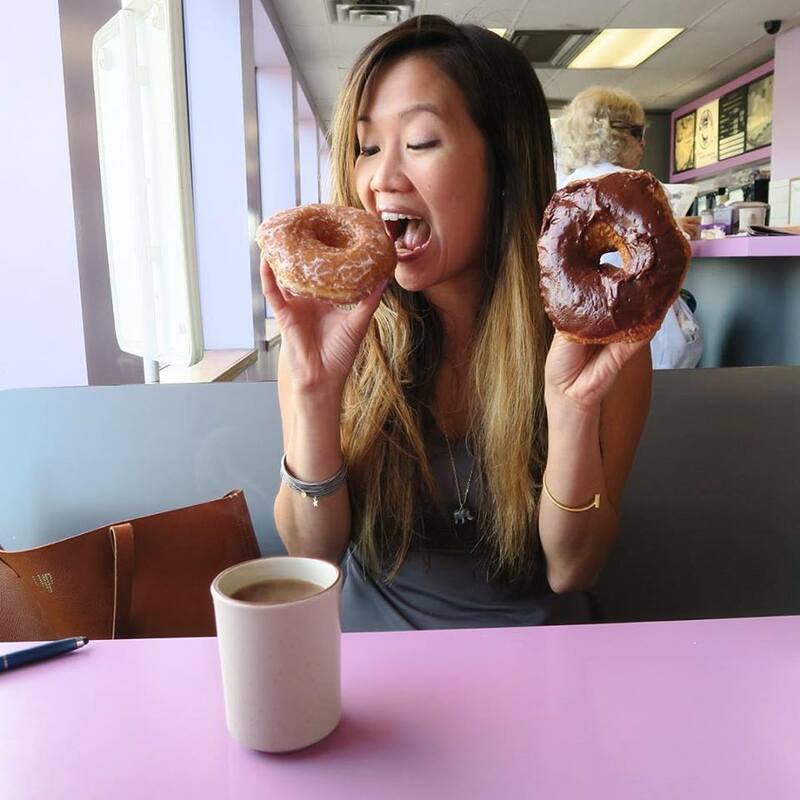 At Ridge Donut Cafe, you’ll find traditional flavors like the hand-cut glazed donuts to more adventurous flavors like Maple with Bacon or Cherry Oreo. The bakers are always experimenting in the kitchen to make new specials. One thing is for certain, these donuts will change your world! For a little somethin' something' to get for that special someone, the Chocolate Covered Cronut, a hybrid of a croissant and donut is the one! Boxcar opened in May 2017 near the Rochester Public Market, next door to Rohrbach Brewing. Here you will find 12 donut offerings each day, with a mix of both classic doughnuts and more innovative flavors like 'Maple Bacon' or 'Mountain Dew Dorito'. On National Donut Day, you get a free sprinkled donut with the purchase of any cold brew. SWEET! Not only do these guys serve some drool worthy doughnuts, but they have killer coffee, as they are the same owners of Glen Edith Coffee and some good 'ol fried chicken. You can get the donut sandwich combo which is fried chicken, bacon, spring mix, sriracha mayo on a glazed donut. Have Mercy! Craving donuts, but can’t eat them due to a dietary restriction or allergy? Don’t you worry, The Red Fern, a vegan restaurant located in the Park Ave neighborhood has created their own vegan & gluten free donuts to be enjoyed by all! Owner, Andrea Parros believes in making creatively inspired food using made from scratch, locally sourced, organic ingredients. Every Friday, baker Karsten Brooks whips up 3 flavor offerings of beautifully crafted donuts available in the restaurant & at Pour Coffee Parlor. Past flavors have varied from Vanilla Rainbow Sprinkle, Chai Ginger Cookie Crumble, and much more. The house favorite is the Raspberry Green Tea Donut made with matcha green tea, dried raspberries, topped with light pink frosting. Awesome Fact Alert: These cake donuts are baked, NOT fried & are just as scrumptious as your traditional donut! Step into the Rochester Public Market on a Saturday morning. Check. Follow the intoxicating smell of donuts. Check. Find Duke’s Donuts under a bright orange canopy. Triple Check! What makes Duke’s Donuts unique from other donut shops? They have a portable donut stand and make everything fresh on-site, every single time. You can find them at various farmers’ markets between Rochester and Buffalo. Their signature Old Fashioned Apple Cider Donut is made from a cake batter that uses cider sourced from Kirby’s Cider Mill in Albion, NY. These sweet creations are full of flavor and a wonderful compliment to your favorite cup of Joe! The name behind Duke’s Donuts is in tribute to Grandpa Duke who loved apple picking & donuts. His memory lives on in the joy that each donut brings! Scratch Bakeshop is one of my favorite places EVER. Owners Molly Hartley (Mommy-to-be) & Kate Cassels joined forces to create a memorable and creative bakery that ALWAYS leaves you hungry. Need some proof? Follow them on Facebook or Instagram and you can understand why I salivate over their desserts day to day. They offer a range of both traditional and allergen free desserts. Gluten Free and Vegan is their jam. So why not have a Fruity Pebbles Vegan Donut? It tastes as good as it looks. Oh me, oh my. I can’t wait to see what they have in store for this Sunday. Their donuts flavors change every time, so you're always in for a special surprise. If you’ve never been, make sure to pick up some of their swoon-worthy macarons and cake truffles! Donut Worry, Be Happy my friends! Now go get after those donuts!